Anubhav Mohanty (born:24 December)is one of the most popular Ollywood and Tollywood Bangla stars in the state of Orissa in India. 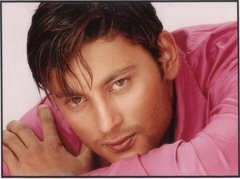 Anubhav Mohanty made his debut in films with I Love You in 2000 Opposite Mumbai based TV actress Namrata Thapa.He made his Debut in Bengali Films with Movie Saathi amaar opposite Rachana Banerjee in a Special appearance. He started his career as a model and has won several award for modelling.Then he started getting ofers from oriya albums and has featured in around around 80-100 video songs.He quietely ruled the album industry for sometime before moving into mainstream films. He debuted in oriya film industry with the film I Love You along with Namrata thapa.The film was a super duper hit.His other films of the same year were Saathire(2004) and Barsha My Darling(2004) becoming Hit and SuperHit respectively. The actor was supposed to do the movie "Sashu Ghara Chali Jibi" under Rajshree Productions , but due to some date problems he opted out of it.Later Sidhanta was roped in for the film. Currently he is the Highest paid and the most bankable star of oriya film industry.